During ZendCon 2013, I was excited to hear about a new toolset called Apigility that the folks of Zend Framework have just released. It is an API toolset built on top of ZF2. The exciting thing is that this Apigility takes care of all the API dirty work for us. HAL content, error handling, JSON structure, and so much more! What I find funny about this toolset, from an implementation standpoint, is that it is not that much different from what we have tooled together ourselves on top of ZF2. Whats better is, we had yet to implement HAL and our error handling logic was still sub-par. So testing this toolset is exciting, in that its another portion of our code that I do not need to implement (well... finish implementing) and maintain. 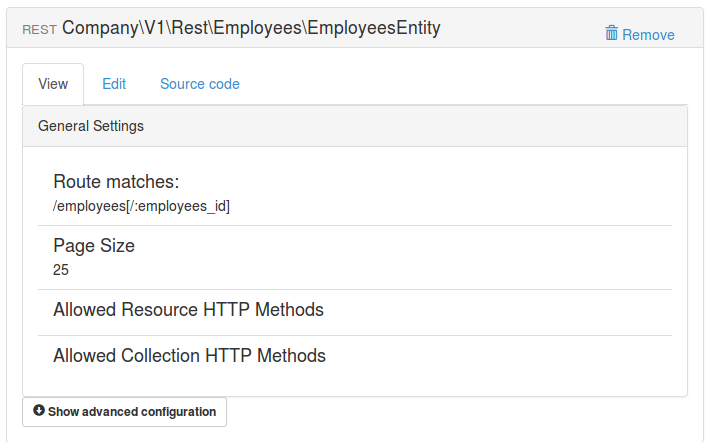 My focus on this Apigility tutorial will be primarily from the perspective of a Code-Connected REST API's. While the Database-Connected REST API's are fantastic, our internal approach to development has shifted to an API First development strategy. This design decision is implemented by first creating an internal class based API, then leverage Apigility to greatly simplify the creation of a public facing API. So, lets dive right in! Before you can begin playing with Apigility, you need to "install" it. The makers of this toolset were kind enough to implement the entire structure and logic flow in just code. This means, no databases to setup, no proxies to configure, no complex routing to setup. Simply bring in the code that is needed and you are ready to go! For more installation options, check out the README on Apigility's GitHub account. These alternative options include both a downloadable Tarball and a Git clone option. You can now access Apigility by pointing your web browser at http://localhost:8080! Below is the exact code I am using to install Apigility on my local linux box. This is a summary of the above commands, plus a few supplemental commands needed for my specific use case. My webroot is located at /var/www. You may need to make adjustments to this for it to work for you as well. Followed by the Create New REST Service button. Here we will name our first REST service. Lets make one that will return a list of employees, along with some basic employee information. Select the Code-Connected tab, enter Employees as the REST Service Name, and click the Create REST Service button. Your new API structure is now built and ready to be populated with code. If you were to make a request from the API now (http://localhost:8080/employees), it would return an error about the GET method not being defined. So lets define the methods for our new API. We'll start by creating the item entity. We'll use the fields employee_id, name, title, & base_salary. Set the class vars as private, add a getter method for each, and the constructor will set each based on an optionally passed in array. We will do all of this in the module/Company/src/Company/V1/Rest/Employees/EmployeesEntity.php file. Then the fetchAll method. We will get the full dataset and pass it into an ArrayAdapter. We will then pass the adapter into the EmployeesCollection. 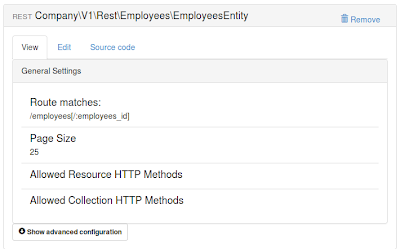 While it's true we have not implemented any code in the EmployeesCollection, the fact that it extends Zend Paginator gives us the functionality we need to afford API pagination. That should be it! You now have a working Apigility Api. In my next post, I'll dig a bit more into tying this directly into your internal Api class structure, as well as some tips on easing the job of interacting with your new API using a great Chrome extension Advanced REST Client.